The eight tracks at Union Station dove under Middleton and appeared to be stub-ended like Union Station in Chicago. 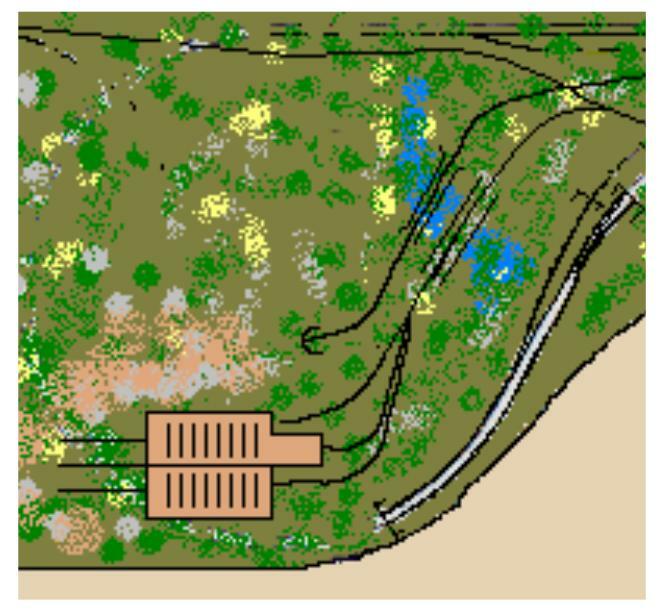 Originally that was the plan, but when the track was being laid out, we found that there was plenty of room to make it double ended with the north throat hidden under the city. Being double-ended, trains could come in from either direction and from either mainline, since they straddled this terminal. When they leave, they could be routed to either mainline. We didn't realize how many passenger trains our members had when we built this area, and now wish we had made room to handle more. Most of them had these collections but couldn't run them at home due to space limitations. They are happy to be able to show them off and run them here. The excess trains were rotated to one of the staging yards. 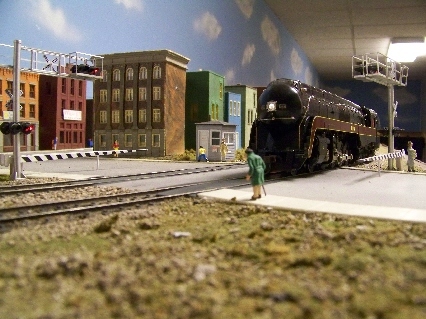 Joe eases a model of the fictitious Silver Steak past Union Station and Hooch Junction. 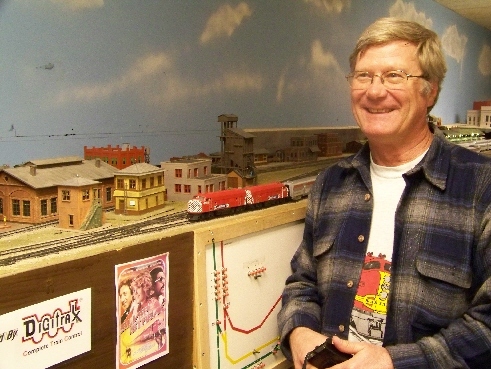 He enjoys creating models of movie trains. The height here is 48". The panel for the terminal is behind him. All of the turnouts on both ends were driven by Tortoise machines controlled by DS64 stationary decoders. Preset routing is setup so that a track coould be aligned to a mainline with the push of a single button, a single turnout command on a throttle, or a single mouse click at the computer. As you can see, the number of different roads and eras represented by passenger trains show the diverse interests of the members. Lines from the east coast to the Midwest to the west all made appearances here. Looking North. 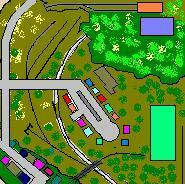 An area on this end is now being developed with car maintenance facilities, wash stand, car barn, etc. With Union Station looming in the background, trains from many different roads and eras utilize this facility. 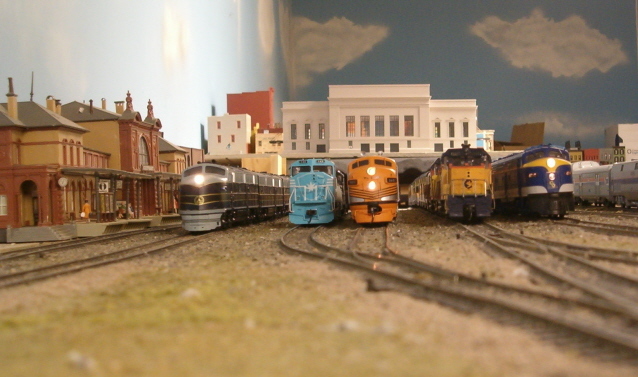 From left, B&O, Maersk, D&RGW, Chessie, C&O, Amtrak. 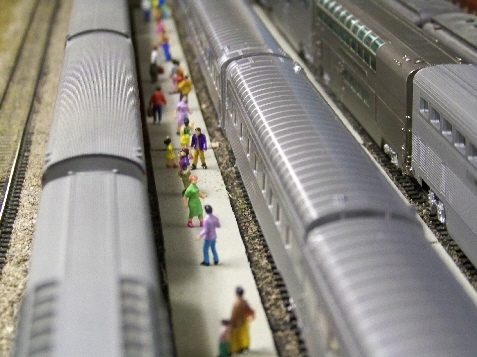 Passengers wait on one of the platforms at Union Station to board their train. Hooch Junction, south of Union Station, features a lot of small businesses, including a new car dealership. A little old lady wisely waits for the speedy Arrow to pass before crossing the tracks. She's not as fast as she used to be. Those are working crossing signals. Click on the maps below to take you to other areas. 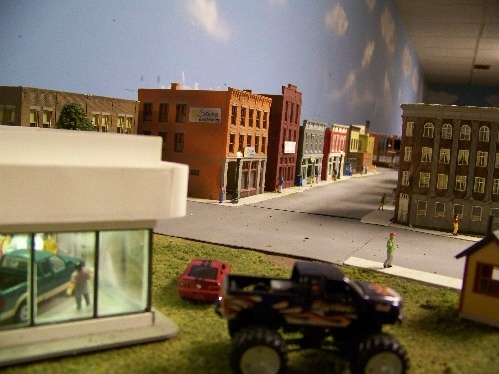 Photos and text on this site are � 1977 - 2012 Sheboygan Society Of Scale Model Railroad Engineers, Ltd. All rights reserved.